We previously discussed the top 10 Global Solar Panel manufacturers as a safe choice when selecting your best solar panel. The rationale was that reputable companies will survive for the next 5-10 years hence you as a consumer can actually claim your warranty if needed. However, the share price of the top Chinese manufacturers has continued to drop by a huge 50% in the last year, after a previous 75% drop in since the start of 2011. The average decline in market capitalization of these Chinese solar panel stocks is nearly 50% in the last year alone. 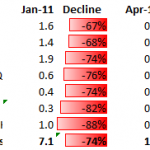 All of them reported large losses last quarter, still driven by global overcapacity. Also, the recent bankruptcy of Suntech, once the world’s largest manufacturer of solar panels, is a large threat that hangs over the other firms. But to put things in perspective, these top 6 solar panel manufactures have a combined sales of nearly one third the global market (about 10GW) and a capacity of nearly double that. At an average solar panel ex-factory price of $0.40 per Wp, this is a revenue of about $4 Billion. So you are basically valuing these firms at only a quarter their revenue. The future of these firms remains very uncertain, and they cannot continue to post losses for much longer. Increased or stabilized pricing is becoming more likely, although any European import tariffs will bring further pressure on these Chinese firms. Panels from China remain the best choice due to value for money considerations, but people should not take any warranty periods as a given, especially not those stretching out over the next 25 years.